Cost Calculator is a powerful and easy-to-use calculation and appointment plugin for WordPress. This unique tool allows you to easily create price estimation forms to give your client idea of the cost of your service. Cost Calculator comes with Calculation Form Builder, Calculations Manager, Dummy Data Importer and provides WPBakery Page Builder (Visal Composer) integration. 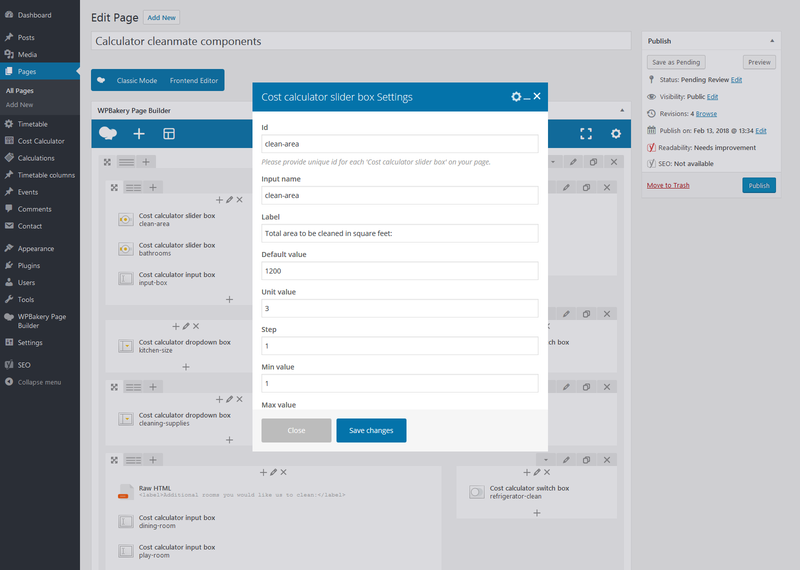 Cost Calculator is fully responsive which means each and every plugin element adapts perfectly for any screen size. The plugin offers its own page builder. 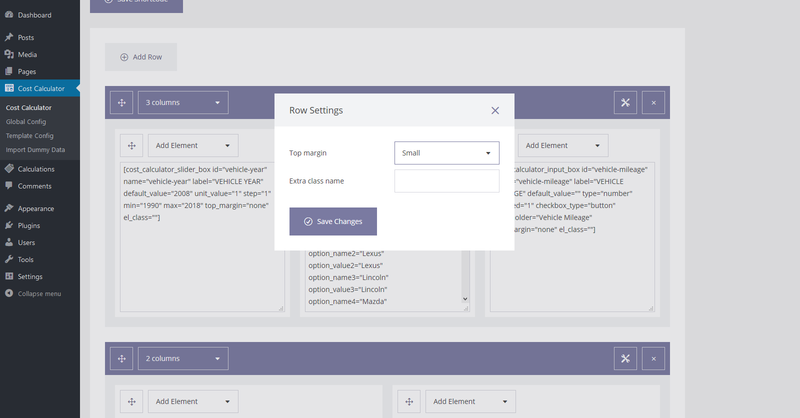 You don’t need any external plugins to work with rows, columns and components. Everything is presented in a legible form. You can create an unlimited number of calculation forms. You can build your calculation form based on columns. 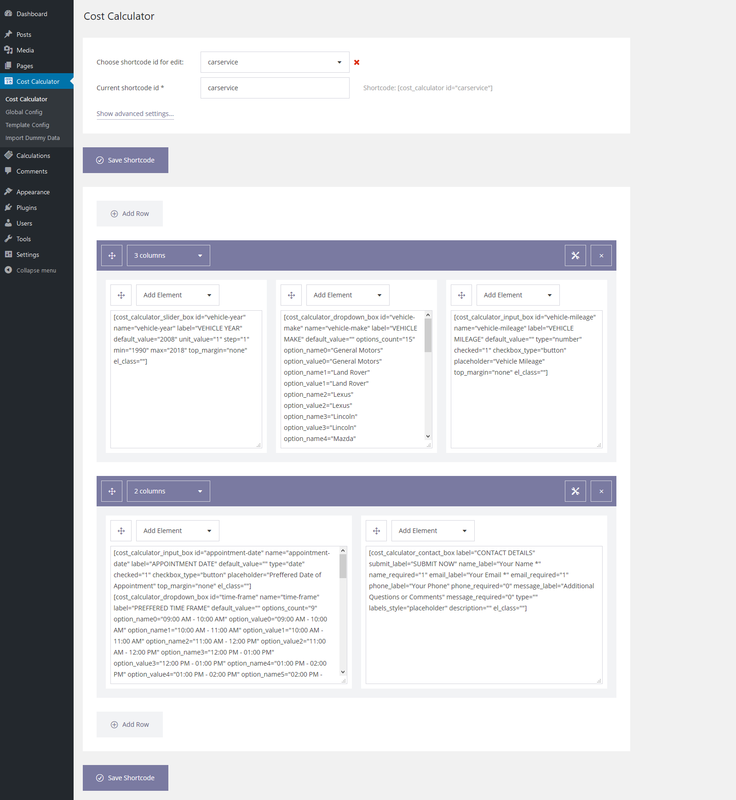 The plugin has many predefined layouts to choose from. 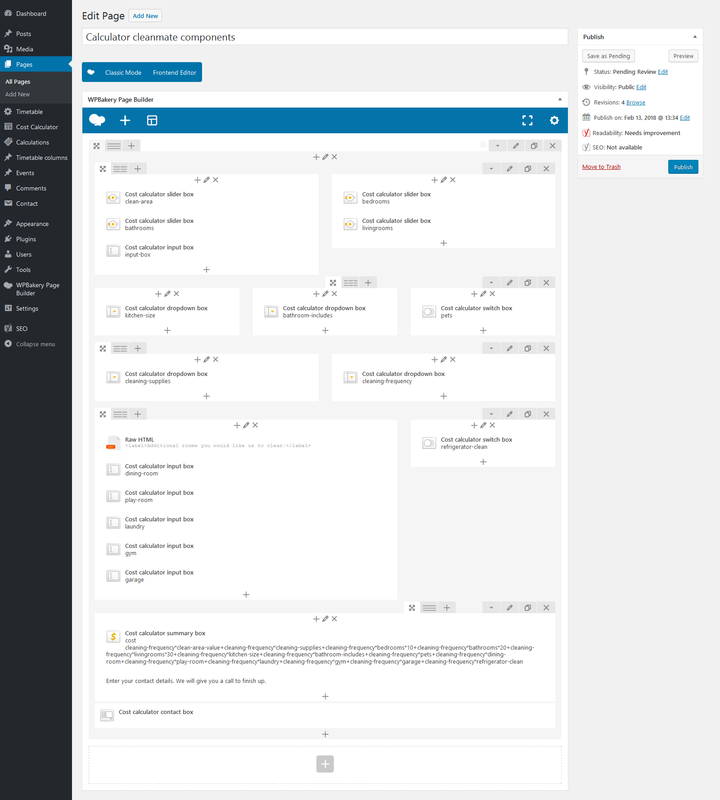 Each of the layouts is fully responsive. 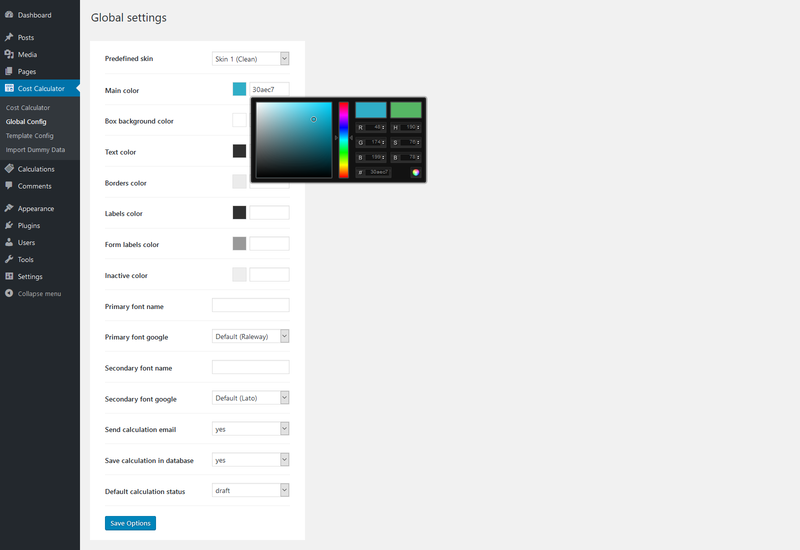 The plugin comes with 3 predefined layout skins and you can define your own colors overwriting the default settings. Choose from hundreds of Google Fonts. The plugin comes with numerous components like Dropdown, Slider Box, Input Box (Type Text, Number, Email, Hidden and Submit), Date Picker, Checkbox, Switch Box or Toggle, Summary Box and Contact Form. Each of the components can be freely configured. 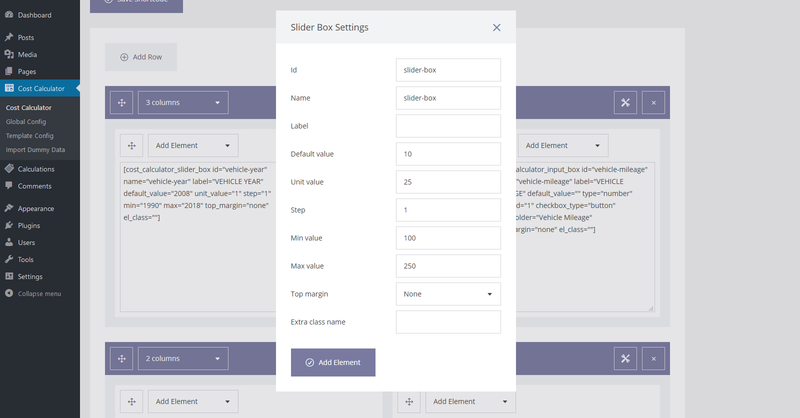 Configure components in a convenient way using the built-in page builder settings. All calculations and sent forms are saved to the database and they are available from the admin level, additionally they are sent to the e-mail address. You can import pre-made demo content easily with a single click, via the Import Dummy Data manager and start working on existing forms. Fix for demo content import issue under WP 5.0. 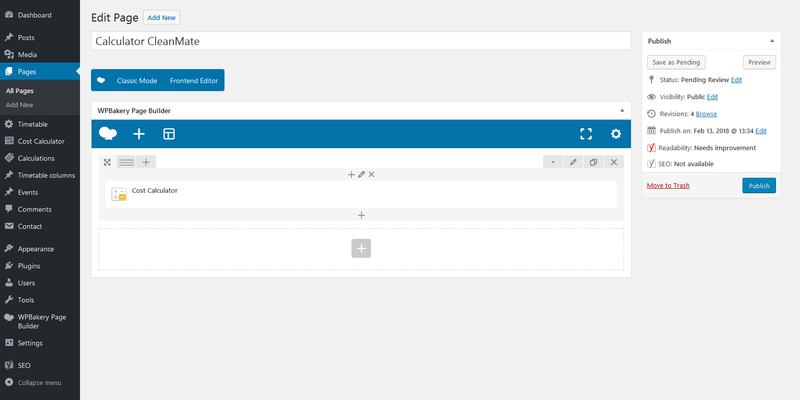 WordPress 5.0 Gutenberg editor integration added. Ability to set number of displayed decimal places for summary value. Bug fix: SMTP settings not being applied in some cases. Ability to set calculator fields as required added. Ability to send via email and store in database multiple summary values from one calculation form. Bug fix: power operator doesn’t work in some cases when present multiple times in one formula. New demos: loan, bmi, hosting, web design. New styles for Car Service Sking Summary Box Component. Fix for checkbox appearance under webkit browsers. Fix for Warning: array_flip() issue. Option to enable reCaptcha in the contact form added. Option to enable terms and conditions checkbox in the contact form added. Plugin directory name changed to ‘ql-cost-calculator’ because of the conflict with other calculator plugin. Option to send email with calculation to client added. Option to hide text input for slider box component added. New example with multiple summary boxes added. Small fixes for styles conficts. Support for subtraction and power operations in calculation formula added. Support for operations between ‘Summary Boxes’ total values added. Support for brackets and division in calculation formula added. Update for calculation email template readability (now in a form of table). Ability to send ‘not checked’ state of the checkbox and switch box added. 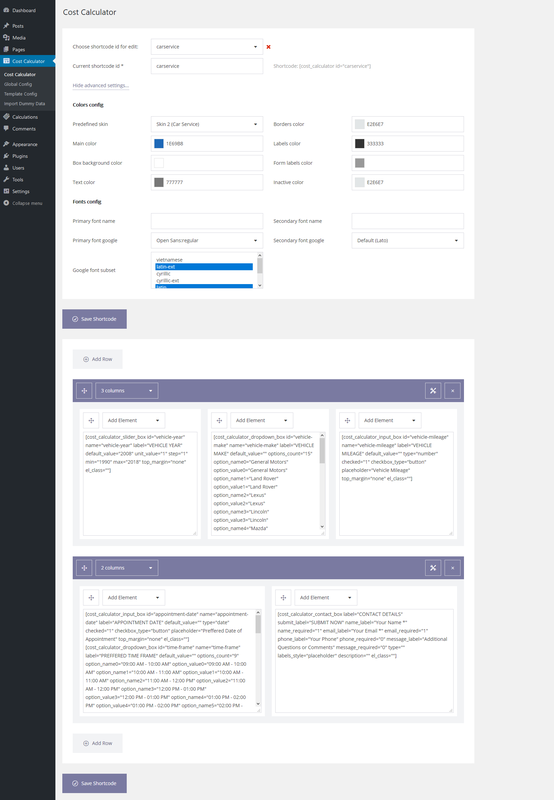 The themes listed below comes bundled with Cost Calculator for WordPress plugin. The listed price includes the theme integrated with the plugin and 6 months author support.